Get ready to view some of the funniest user submitted pictures on the Internet and laugh your head off. 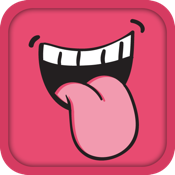 LOL is a fast and incredibly convenient way to flip through thousands of different comical pictures. LOL is a great way to burn five minutes of free time or spend an hour or two browsing through the countless images uploaded every day. Casually view pictures in portrait or landscape and download photos to your device for offline viewing. You can even share photos with friends via email or post them to your Facebook wall or Twitter account. LOL provides a wonderful viewing experience which has been optimized for the IPhone, IPad and IPod Touch.